Original Editors - Amanda Huber & Emily Sipe from Bellarmine University's Pathophysiology of Complex Patient Problems project. What is an NSAID? Nonsteroidal Anti-inflammatory drug. NSAIDs are prescribed to decrease pain and inflammation. An early finding of anemia may warrant more extensive diagnostic testing such as an endoscopy or radiography in determination of NSAID gastropathy. Hematocrit and hemoglobin levels may also provide information about the extent of bleeding from perforation or hemorrhage. As NSAID induced ulcers are often asymptomatic, patient history and diagnostic tests/lab values are important in diagnosis. 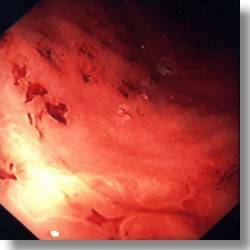 Endoscopy has a success rate of 90% for diagnosis of a peptic ulcer, however, it is expensive and the rate of correct diagnosis of NSAID gastropathy is high among physicians. (See Tamblyn et al 1997 study on high gastropathy diagnostic rates by physicians.) 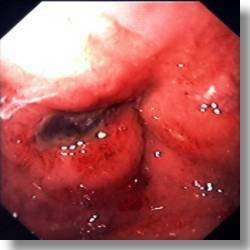 Radiography with barium can also detect and diagnose peptic ulcers but is less common than endoscopy. NSAIDs inhibit the enzyme cyclooxygenase which is a necessary enzyme for the synthesis of prostaglandins from arachidonic acid. While inhibition of COX allows NSAIDs to have their anti-inflammatory and analgesic properties by blocking proinflammatory prostaglandins, it also blocks prostaglandins that protect the gastrointestinal system. Prostaglandins in the gastric system help maintain gastric blood flow, increase bicarbonate production, and increase mucus that serves as a protective barrier against bacteria colonization and mechanical injury. Decreased blood flow and decreased mucosa decrease the healing ability and leave the stomach more exposed to injury from pepsin and gastric acid. Furthermore, these decreases lead to “increased back-diffusion of hydrogen ions into epithelial cells with resultant impaired mucosal resistance to injury”. The function of cyclooxygenase in this process led to the establishment of two COX isoforms: COX-1 and COX-2. COX-1 is found throughout all tissues of the body whereas COX-2 is in the area of inflammation such as in an area of osteoarthritis contributing to the inflammation. Previous NSAIDs included both COX-1 and COX-2 inhibitors, however, in the 1990s COX-2 medications were developed to act on the areas of inflammation without causing the mucosal effects to the GI tract from inhibitng COX-1. COX-2 inhibitors are associated with fewer upper GI side effects, however, they are not as symptom free as hoped and still place people at risk of gastroduodenal mucosa injury. The opinion that only COX-1 affects GI issues is simplistic and not the full story. Medications that suppress acid have shown to be effective in combination with NSAIDs to a greater extent than COX-2 medications alone. These medications are discussed below in the medical management section. The effects of NSAIDs can occur throughout the GI tract from the esophagus to the colon. 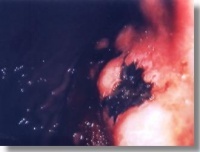 A potential complication of ulcers left untreated is that the ulcer can perforate through the stomach mucosa and cause infection to spread or the ulcer can erode stomach arteries creating a life-threatening bleed. In addition to effects on the GI system, NSAIDs also affect the renal and cardiovascular systems. For more information on systemic involvement from NSAIDS, please see en.wikipedia.org/wiki/Non-steroidal_anti-inflammatory_drug. One of the difficulties of NSAID gastropathy is that its course is asymptomatic 50% of the time. Therefore, it is essential that health care professionals assess each patient's risk factors and recommend either discontinued use of an NSAID or inclusion an accompanying cytoprotectant agent in those patients considered high risk. A preventative approach of discontinued NSAID use is recommended over treating the gastropathy. However, if it is not possible to discontinue use of the NSAID, PPIs or H2-receptor antagonists may be prescribed to reduce the gastric effects. The use of a PPI along with NSAIDs has shown decreased risk of NSAID-related ulcers and adverse drug events compared with H2-receptor antagonists. A COX-2 selective NSAID along with a PPI has shown the best results for reducing gastropathy risk in those who must continue to take NSAIDs. Other treatment options include misoprostol which is a synthetic prostaglandin designed to replace those loss by NSAIDs. However, misoprotol has a lot of side effects that have proved difficult such as abdominal pain, nausea, and diarrhea. Many of the patients seen in physical therapy will be taking NSAIDs for their disorder. PTs must be aware of risk factors, clinical signs and systems (and be aware the patient may be asymptomatic but still have NSAID induced gastropathy), and they must take a detailed patient history including medication questions concerning multiple NSAIDs, prescription drugs combined with NSAIDs, and changes to medications. Any patient who presents with new onset of back or shoulder pain, who takes NSAIDs, and who presents with signs and symptoms of a peptic ulcer must be referred to the MD. Goodman and Snyder list clinical signs and symptoms of NSAID induced impairment, risk factors for NSAID-induced gastropathy, and a formula for calculating a patient's risk of NSAID-induced gastropathy in their book Differential Diagnosis for Physical Therapists: Screening for Referral. Below are clinical signs and systems associated with NSAID-induced impairment. Melena Risk factors for NSAID induced gastropathy are listed below. Any risk factor recognized should serve as a red flag. 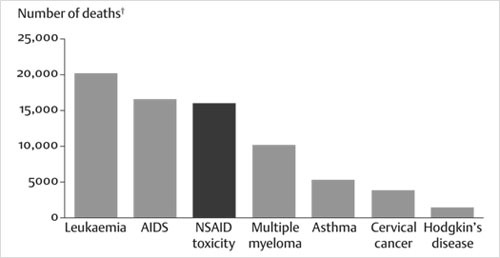 The incidence of mortality and morbidity from NSAID use is high among the aging population and taking a detailed patient history is essential. Case Study #1: The relationship between upper gastrointestinal hemorrhage and drug use: a case control study. • This prospective cohort study examined the way in which NSAIDs are necessarily or unnecessarily prescribed, if MDs are effective at diagnosing NSAID related problems, and if NSAID side effects are treated effectively. The authors searched for common factors present in suboptimal prescription and use of NSAIDs. • Patients presented to the MD’s office with one of two cases: either a recent exacerbation of chronic hip pain (with treatment options either lifestyle modification, physical therapy or medication), or the patient presented with epigastric pain secondary to NSAID use, and the MDs must recognize, diagnose, and determine the best course of action. • NSAID gastropathy was correctly diagnosed 93.4% of the time and was acceptably managed 77.4% of the visits. • When comparing COX-2 selective NSAIDs with non-selective NSAIDs, the authors did not find a substantial enough difference in outcomes to warrant the higher cost of COX-2 specific drugs. Additionally, semi-selective drugs did not show any advantage over other NSAIDs in protection of the GI system. • NSAID and misoprostol may be a good alternative for patients at risk of GI injury. This case study examines a 59-year old female with osteoarthritis who is in the no risk/low risk category for GI events for what medications would be best. 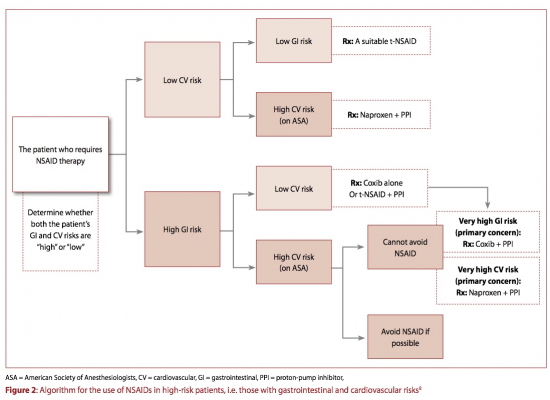 • For someone with little to no risk for GI complications, no known cardiovascular requirements, and who does not use aspirin chronically, a traditional nonselective NSAID would be fine. COX-2 inhibitors are an option but they are more expensive. • Misoprostol and PPIs have been shown most effective at healing and preventing NSAID related ulcers. ↑ 1.0 1.1 1.2 1.3 1.4 1.5 1.6 1.7 1.8 Roth S. Coming to terms with nonsteroidal anti-inflammatory drug gastropathy. Drugs(2012, May 7), 72(7): 873-879. ↑ 2.00 2.01 2.02 2.03 2.04 2.05 2.06 2.07 2.08 2.09 2.10 2.11 2.12 2.13 2.14 2.15 2.16 Lanza F. A guideline for the treatment and prevention of NSAID-induced ulcers. Members of the Ad Hoc Committee on Practice Parameters of the American College of Gastroenterology. The American Journal Of Gastroenterology. (1998, Nov), 93(11): 2037-2046. ↑ 3.0 3.1 Gigante A, Tagarro I. Non-steroidal anti-inflammatory drugs and gastroprotection with proton pump inhibitors: a focus on ketoprofen/omeprazole. Clinical Drug Investigation. (2012, Apr 1),32(4): 221-233. ↑ Gastrosource. Non-steroidal anti-inflammatory drug (NSAID)-associated upper gastrointestinal side-effects. http://www.gastrosource.com/disease-area-information/11674565?itemId=11674565 (accessed 9 March 2013). ↑ Taylor, RB. Manual of Family Practice, 2e. Lippincott Williams & Wilkins, 2002. ↑ Atlas of Gastroenterological Endoscopy. Stomach: NSAID Gastropathy. http://www.endoskopischer-atlas.de/m15e.htm (accessed 9 March 2013). ↑ Wallace, JL. Prostaglandins, NSAIDs, and Gastric Mucosal Protection: Why Doesn't the Stomach Digest Itself? Physio Rev 2008;88(4):1547-65. ↑ 9.0 9.1 Goodman, CC, Snyder, TEK. Differential Diagnosis for Physical Therapists: Screening for Referral. St. Louis: Saunders Elsevier, 2007. ↑ Becker, JC, Domschke W, Pohle T. Current Approaches to prevent NSAID-induced gastropathy—COX selectivity and beyond. Br J Clin Pharmacol.2004;58:6:587-600. ↑ Lanza, F, Chan, FKL, Eamonn, MMQ, and the Practice Parameters Committee of the American College of Gastroenterology. Guidelines for Prevention of NSAID-related ulcer complications. Am J Gastroenterol.2009;104:728-738. ↑ Schellack, N. Overview of gastropathy induced by nonsteroidal anti-inflammatory drugs. S Afr Pharm J 2012;79(4):12-18. ↑ Tamblyn, R, Berkson, L, Dauphinee, WD, Gayton, D, Grad, R, Huang, A, Issac, L, McLeod, P, Snell, L. Unnecessary prescribing of NSAIDs and the management of NSAID-related gastropathy in medical practice. Ann Int Med. 1997;127:429-438. ↑ Helin-Salmivaara, A, Saarelainen, S, Grönroos, JM, Vesaleinen, R, Klaukka, T, Huupponen, R. Risk of upper gastrointestinal events with the use of various NSAIDs: a case control study in a general population. Scandinavian Journal of Gastroenterology 2007; 42:923-32. ↑ Lee, L. A healthy 59-year-old woman with osteoarthritis. Adv Studies in Medicine 2003;3(6B):S519-20.